The 2018 Hyundai Accent starts at just $14,995. But it's not only bargain hunters who will want this four-door sedan. Hyundai has included enough upscale features that the Accent almost feels luxurious. At any rate, the Hyundai never looks cheap, inside or out. If you want a manual transmission, the base SE trim is fine. If you're looking for a more luxurious cabin or prefer automatic transmission, we recommend the top-tier Limited trim. It's still a bargain at $18,895. Skip the SEL, which is about $2,000 less. If you can afford the SEL, you can probably afford the Limited. The 2018 Nissan Versa is less expensive, starting at the rock-bottom price of $12,995. On the plus side, for that price you get a spacious back seat and trunk. Unfortunately, in almost every other way, the low prices are evident in its cheap hard plastics, sparse features, and uncomfortable seats. The sedan price can go as high as $15,840 for the SV trim, but its added features don't improve upon its abundant flaws. For its price point, the Hyundai Accent offers lots of tech. Standard tech includes 5-inch touchscreen, Bluetooth, USB port, and four-speaker audio system. Available features include 7-inch touch screen, two more USB ports, six-speaker audio system, satellite radio, and Apple CarPlay and Android Auto. The 2018 redesign introduced a lot of the coveted tech that people love. On the other hand, the 2018 Nissan Versa has cut its tech offerings. This year Nissan has cut the SL-trim, so a lot of technology available only in that trim isn't even offered anymore. You get a four-speaker sound system and Bluetooth standard. Available features include USB, push-button start, satellite radio, and 5-inch screen with navigation, voice recognition, and smartphone integration. 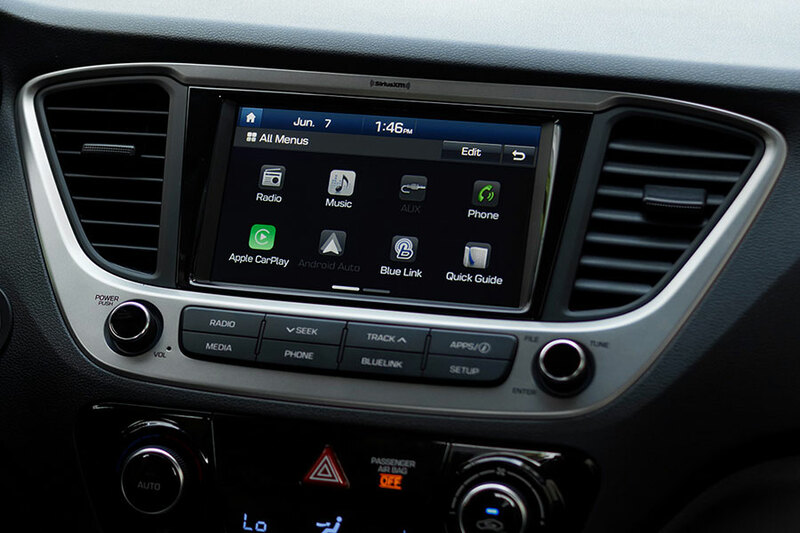 There's no Android Auto or Apple CarPlay. No traffic, no navigation, and no voice control. In a class where most cars are designed to be cute or spunky, the Accent exudes a quiet refinement. This Hyundai is all grown up and it shows. While the plastics are hard, they are top-quality and well-grained. The cabin looks simple and straightforward, free of clutter, and boasting wide seats with plenty of legroom for a small car. Meanwhile, the 2018 Nissan Versa has a garrish, hard-plastic cabin that feels and looks cheap. On the plus side, the seats are wide and passenger space is plentiful. But the seats are so uncomfortable that you'll only want to use the Versa for short trips. Nissan is selling the lowest-priced new car in America, and, unfortunately, it shows in the cabin. If your only aim is to save money, the low starting price and good fuel economy of the Nissan Versa are a draw. But if you don't want to drive a car that looks and feels as cheap as the price tag reads, the Hyundai Accent is a far superior commuter car.